Madeira – holiday destination, beautiful island and one of the most extraordinary airports in the world. 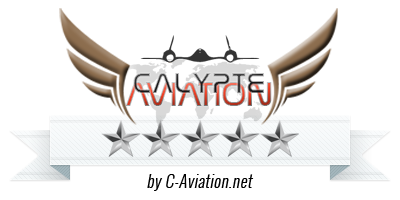 Aerosoft’s Madeira X does a good job bringing this place to Flight Simulator X.
I was not sure whether I should rate it with 4 or 6 stars. 5 star rating was the average of my thoughts. It is clearly an exceptional scenery in many ways and the runway alone places it among the most amazing sceneries in FSX. On the other hand – it’s already several years since the current version has been published and some features like textures and vegetation autogen can clearly use an update. Please read the whole review, take a look at my screenshots and decide for yourself. About this I am certain – you will not be disappointed with this scenery! Madeira is a popular holiday destination. This Portuguese island on the Atlantic Ocean enjoys mild climate that always drawn the most famous figures. Empress Elisabeth of Austria and Winston Churchill were among many who came here to recover from health problems. 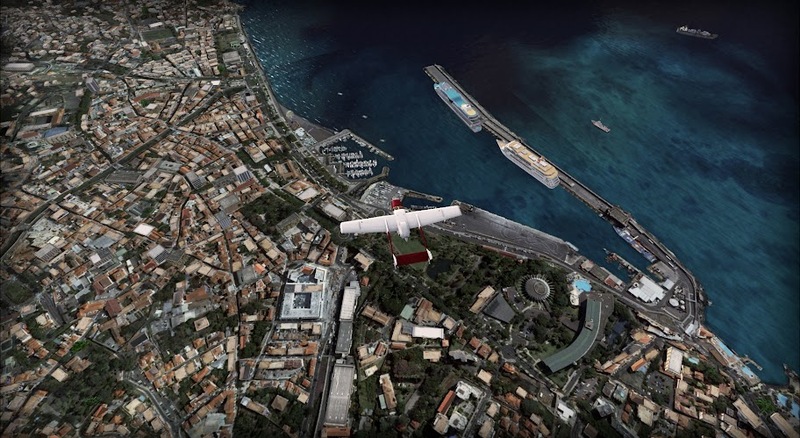 Funchal Airport (informal name) was created in 1964 and since then it has been extended several times to accommodate larger aircraft and increasing traffic. Before the airport was built – Madeira was visited by flying boats, but slow seaplanes could not keep up with modern airliners of 1950s and 1960s. They required a proper, paved runway which was opened in 1964. It was 1600 meters long and, as such, it lasted for two decades. In 1980s a 200m extension was built but it was still too short for modern, long-range airliners. With no space to extend it further a unique solution was devised – part of runway is supported with concrete columns that are 70m high. Airport can handle all airliners. The biggest plane to actually land here was Boeing 747-200 which tested the new runway. European cities (mostly in Portugal and UK) are the most popular destinations. Airport serves as a base for local carriers which use small planes and offer sightseeing tours and short flights to Porto Santo. Madeira is also frequented by ferry pilots who transport small planes across Atlantic. 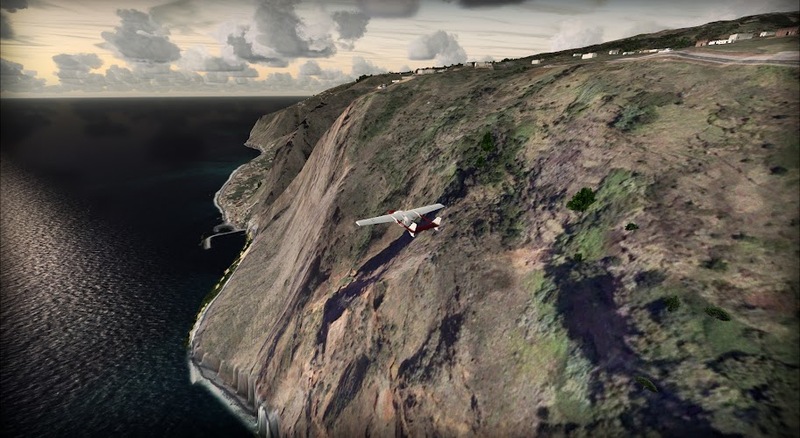 Madeira scenery is available in all popular add-on stores including Aerosoft (28,89 Euro – including 23% tax), FlightSimStore (42,55 AUD) and FS Pilot Shop ($34.99). It’s available as a download or boxed product. Installation is typical for all Aerosoft’s add-ons – user needs to provide his email and produkt key to unlock the installer. There is a 35 page long manual in English and German. It describes the airport, the scenery and provides suggested settings. Charts are included in additional PDF file. Unfortunately they date back to the first version of this scenery (2007). I am reviewing the second version that is just 3-4 years old and I would prefer updated charts. Fortunately they are easy to find in Portuguese AIP. Inside FSX/Aerosoft/Madeira X folder there is a configuration tool. It disables vehicle traffic around the airport to improve performance on low-end PCs (I did not find it necessary on my PC). Both the photoscenery and mesh are superb. 50cm/px images covering such area are still rare and they clearly make a difference. 10m mesh resolution is exactly what I am looking in such a scenery. What is most important for me – it is how the mesh and the photoscenery work together – and it is amazing! 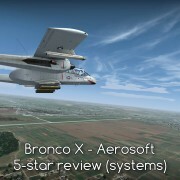 Ground features were sharp even when I flew very low and terrain complexity looks like if they used 5m or even 1m mesh. It’s common for good photosceneries to improve the impression made by mesh. I do not want to bore you with technical details. It is much better to just describe some of my flights. 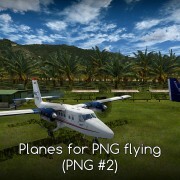 I used Cessna 337 to fly around the island – following real world routes described here: sightseeing flights. I also took Spifire and had some fun flying at low altitude into mountains in the middle of island. 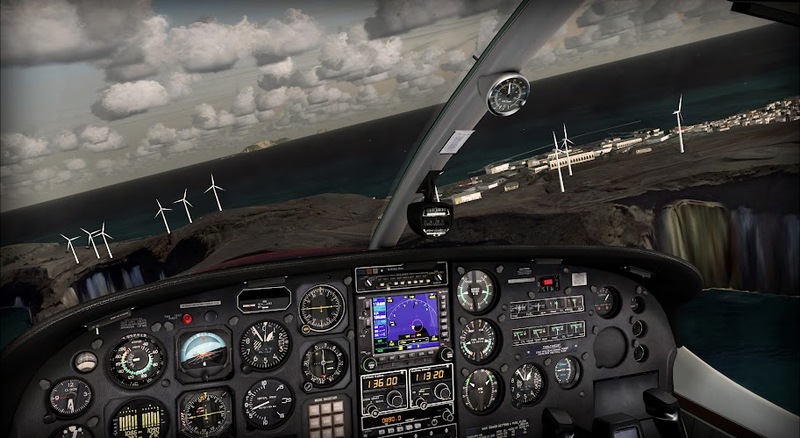 If you do not like flying very low in FSX because of mediocre level of details – you will be positively surprised here – even at 300-500ft above ground the details are visible and sharp. 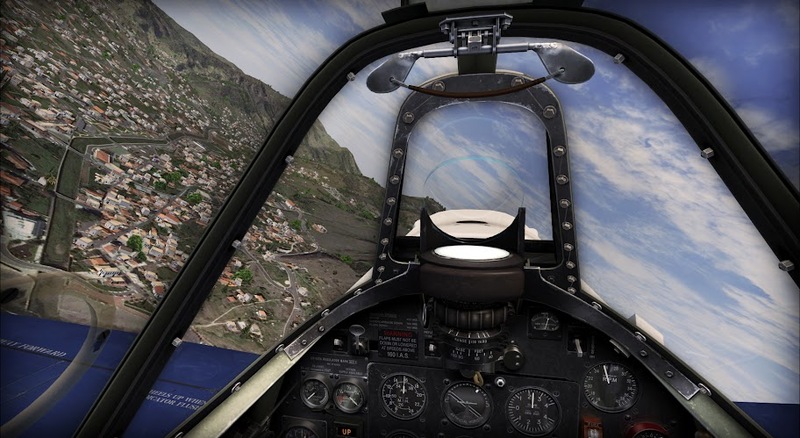 Of course – the quality comes at a price – low level flight around the island in a fighter-jet caused serious blurries. 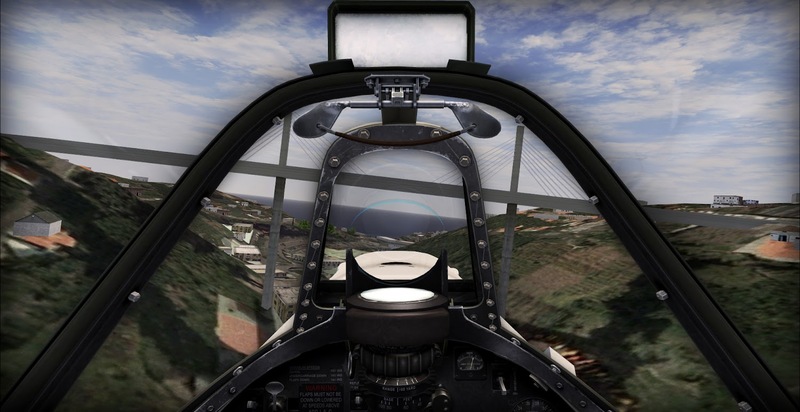 Even P-51 Mustan flying at 250-330 KIAS made it hard for FSX to keep up with loading textures. But this is not the fault of the scenery – I consider the fact that it kept up with Spitfire’s speed a success. I wrote this review in Polish some time ago with a different graphics card. My current setup allows for P-51 flights at 250-275 KIAS. Textures get blurry over 280 KIAS. Madeira X features what I would call – a “standard autogen”. It means that I really enjoy urban building density, models and textures but when I fly over forests… I only see sparse trees. Forest photoscenery covered with only a few trees looks bad. On the other hand – there are great towns and cities. And even small villages have very nice autogen. Small towns, settlements and lone farms in this scenery really impressed me. They clearly show the time developers spent placing all these houses in their real locations. 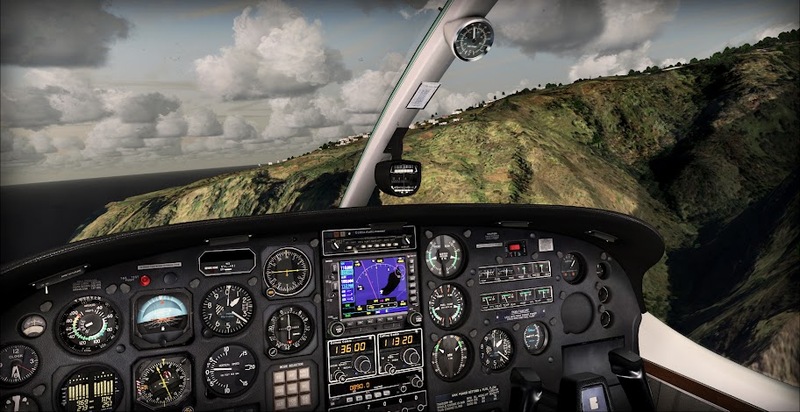 Unfortunately flying at low altitudes show a minor mistake – vector coastlines included in this scenery are not aligned with mesh in coastal areas. 10-20m mistake in places where terrain is elevated causes strangely looking vertical walls in places where steep cliffs should be. It’s a common problem in FSX sceneries, but some show that it can be corrected (read my review of Skiathos). On my trips in Spitfire I saw a number of bridges that span both sides of valleys I was flying in. I could not help myself and repeatedly flew under those bridges. Although simplified – they look similar to the real bridges on Madeira. On my flights around the island I passed by several wind farms. Although I kept my Cessna in a safe distance I noticed that the turbines seem as they are not synchronized – blades of each one are in slightly different position and I think they even turn at slightly different speeds (although I did not check if I am right on that). Lighthouses made the biggest impression during evening and night flights. They use volumetric light effect that is really nice. I did some checking – they are in correct positions so you can use them for navigation if you know their real world locations. I checked only one against the photos of the real lighthouse – it was similar. As a side note I can say that the light cycles are not realistic… so do not try to use them for naval navigation. I will start with what I do not like – some textures. 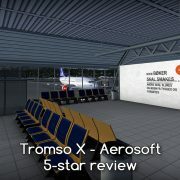 I feel like Aerosoft covered the airport with the same photoscenery that was used for entire island. 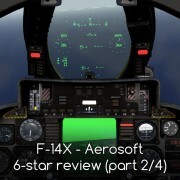 It may be superb in low-level VFR flight but from the height of cockpit – it looks blurry and lacks detail. I also think that there are far too few small objects at this airport. I was just recently reviewing Skiathos and some ORBX airports that are crowded with small objects and this one strikes me as empty in comparison. But I have to admit that the objects that were placed here are nicely modeled and look just like the ones I saw on photos of this airport. 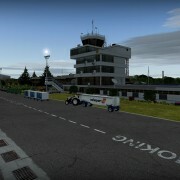 Airport building was created in a “standard” resolution. It is properly modeled and textured when compared with most add-on airports but you may find it just a little out of date when compared with recently published sceneries. This scenery uses 2d images of people on the balcony. At the first sight I felt it’s a shortcut but after some consideration (and after several hours I spent here during 40+ flights) I have to say that the idea is brilliant. When looked from the air-side – you see a crowd that would never performed well if they had modeled it in 3d. From an angle of about 70 degrees – crowd almost disappears – but it’s not that much of a problem – you will almost never look at this balcony from this angle. I am a little surprised by how AI / static planes were created. The disappointment came first – there are no static planes here! If you do not use AI traffic – you are alone here. 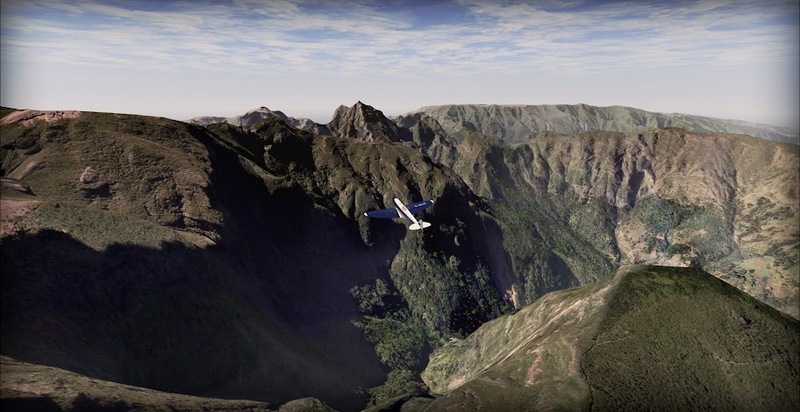 But for those who use AI traffic the surprise will be very pleasant – scenery uses its own traffic – several planes in liveries of airways that fly to Madeira. I do not remember sceneries that would go so far – this is a very good move! I kept the best part from you. The runway. It’s excellent. The model and textures of the construction are recreated in tiny details so I can admire it on landings and some take-offs. I even launched a small drone aircraft in FSX to fly over the road that passes under the runway (you can see the image from this flight above). You have to visit this place at least once if you have this scenery. I have similar feelings to those I had at Madeira Airport (minus the runway construction – obviously). The only difference I see is the feeling of emptiness – there are even fewer small objects at this airport. I like this scenery in terms of performance. I mentioned that it suffers from blurries in high speed-low level flight – but it’s a common problem with all photosceneries and there is not much the developer can do to solve it. In terms of FPS the performance is good. I did not see a serious impact on my PC. I was not sure if I should rate it with 4 or 6 stars. 5 star rating was the average of my thoughts. It’s clearly an exceptional scenery in many ways and the runway alone places it among the most amazing sceneries in FSX. On the other hand – it’s already several years since the current version has been published and some features like textures and vegetation can clearly use an update. Please read the whole review, take a look at my screenshots and decide for yourself. About this I am certain – you will not be disappointed with this scenery! I consider 30 dollars to be a good price for two airports and two islands (one of considerable size). This scenery gives you a plenty of space to fly VFR and a nice destination (destinations) for IFR flights. 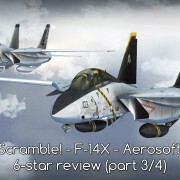 F-14 X - Aerosoft - review (6*) - Scramble!